First up is how things went when I did a diversity check of my classroom library. If you listened to the last episode (#27 with librarian Sarah Threlkeld) you heard us chatting about this activity she did with her students to reflect on the diversity found in their school library. And I think even way back to Episode 18, I mentioned reading this fantastic blog post over at Lee & Low Books that shared how one teacher helped her class analyze the books in their room to find out how different genders and races are represented. I’ll include a link to that article and the main framework of what I did is pulled directly from there. So I want to be clear – this is not my idea, but I’m sharing how it went for me with the idea that you might want to try it, too. First I’ll run through the process and then discuss my major takeaways, and how I’ll do it differently next year. First, I showed my 5th graders two infographics. Both have been shared widely on social media and you’ve probably seen them, but I’ll post them on the website so you can find them easily. 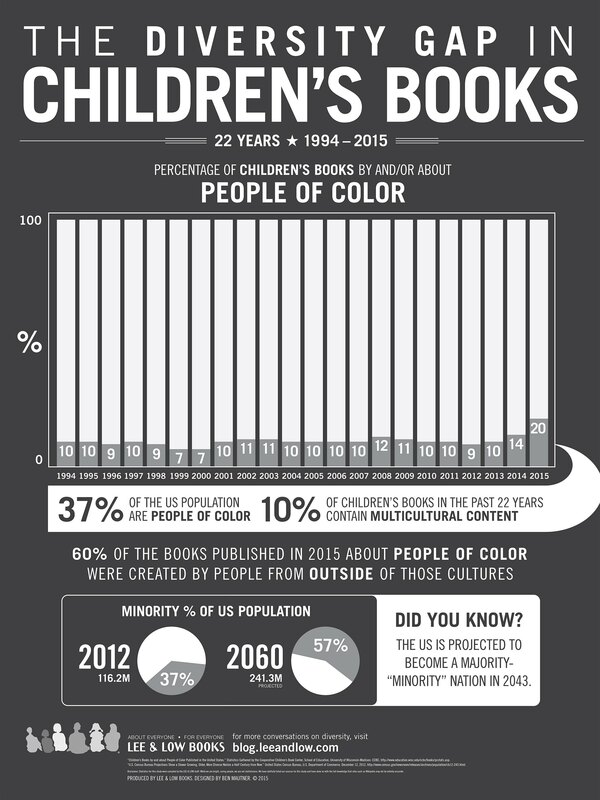 The first one was a black and white image called “The Diversity Gap in Children’s Books” and it shows a bar graph of the percent of kid’s books in the past 21 years that contain multicultural content. And shows that sadly steady around 10% from 1994 to 2014. 2014 was a slight tick up to 14% but well below where it should be. This picture, which is put together by Lee & Low Books also includes pie charts that show the percent of the US population that are people of color and a projection that the U.S. population will be 57% minority in 2060, which really brings into focus the disparity. 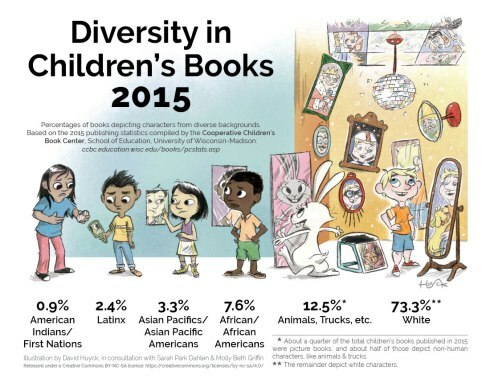 The second infographic I showed them is from ReadingSpark and called “Diversity in Children’s Books 2015” and is in color with illustrations showing the percents of various groups featured as characters in kid’s books – 73.3% White and 12.5% Animals/Trucks, 7.6% African/African American, 3.3% Asian Pacific/Asian Pacific Americans, 2.4% Latina/o, and then 0.9% American Indian. So, we gathered on the rug and huddled around the Promethean board where I had the images displayed. And I simply asked my students to look carefully at them both and to chat with a partner about what they noticed. I explained terms where necessary, but otherwise I just let them have a look and asked them to make some observations. How many books do we have by and about Native Americans? How many books have an African American main character? What genre has the most diversity? Are there more books about people of color than BY people of color? Do we have more books featuring boys or girls? I’ll be honest with you – their questions went beyond the scope of what I had planned. They went pretty deep and the data we pulled really only started to answer the questions they had. So once they had some questions in mind, I had them pair up and grab one bin of books from our classroom library to start sorting through. Our bins are sorted by genre. I used a Google Sheet to record the genre of that bin and some other information. First, they separated out all the books with people on the cover and analyzed just those. Then they counted how many covers included a person of color and jotted that number down. And then they counted how many covers featured at least one girl. And from there, generated percentages using a calculator – which they enjoyed, but then I quickly learned that we needed a refresher on how to figure out percents. As each pair worked, they added their data to a shared Google Doc so we could see the information come to life in real time. It was exciting and the kids were so engaged! I think that when they feel like they are doing real work, important work, and are helping you out in a genuine way, they are all in. And some recognized the injustice in the situation and were eager to start to set things (not right) but on a better path. Okay – on to the data pulled about race and ethnicity. The percentage of books with no people of color at all on the cover was pretty high. The best category seemed to be realistic fiction which had percentages like 21%, 43%, 63% and one bin at 93%. Some of the least diverse categories were Fantasy with 79% , 80% and 100% of the books in those bins featuring only white people, and graphic novels with 85%. So, now it’s pretty clear where are some particularly troublesome areas and when I go to purchase books, those genres will be my focus. In the words of one of my girls, “We have a lot of books about white boys in this room!” Yes, we do! And most of them are fantastic, but adding other voices is only going to help so that every kid can see themselves and see the wide range of experiences in our country and in our world. “A lot of books have shadow people on the cover.” They were referring to silhouettes, and this observation lead to some great discussion about what the publishers might intend with that. They were questioning how to categorize those types of covers and if we needed another category. Another big topic that came up was that some forms of diversity weren’t being accounted for in this exercise. And that all stemmed from the debate about what gender pile to put the book George in. Do we go by the clues on the cover which might suggest a boy? Or do we account for what we know of the story (which is about a transgender girl) and my students said, “We need another category, Mrs. Allen.” Many students mentioned that religion or disability wasn’t included in what we were looking for. Also, because we only used the visual of the cover, that is really limiting. A cover that includes a girl or a person of color does not mean that character plays a big part or that they are portrayed in a great way. Were they just the sidekick? Connect with another class doing the same thing and share results. I think that could be powerful. Take this to that next step and have kids research and recommend titles to fill out the gaps in our library. So that they are playing a part in creating a more diverse selection of books that they will love. Mainly, I was just acutely aware of how limited this exercise was. And yet – I am so glad we did it! The data we gleaned is not going into some peer-reviewed journal, but it gave these kids (and me!) a taste of that data analysis. And, the best part, it lead to even more questions – and now they know that it’s a question they should ask about the books surrounding them! And our shared spreadsheet is messy – some percents aren’t accurate and some kids categorized a little differently. But, my hope, is that when they find themselves in a library or bookstore and pick up a book, they’ll remember this and maybe carry those questions and discoveries forward with them and start to (seek out – no! That’s too weak) start to demand more books that reflect our cultures and our communities. And for us, let’s not shy away from this work, as uncomfortable and complicated as it sometimes can be. And as always, I really want to hear your ideas about this topic. You can tag me on Twitter or Instagram – our handle is @books_between or email me at booksbetween@gmail.com and I’d love to hear and share your ideas. Today I am so excited to welcome Madelyn Rosenberg and Wendy Shang to the podcast! They are the authors of the recently released middle grade novel This Is Just a Test. We chat about their collaboration process, epic Thanksgiving dinners, Trivial Pursuit, and all our favorite fashions from the 80s. Take a listen. 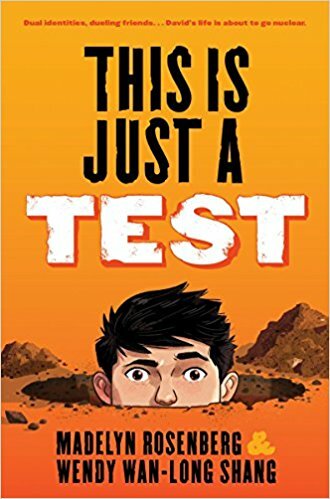 Your middle grade novel, This is Just a Test, was just released this past June 27th – congratulations! I loved David and his story but I think for me, my favorite part of this book was that it was set in the early 80s with big hair and boom boxes and Boy George! What was your research process like in order to make sure that the setting was authentically 1983? Some quick questions about the 80s…. Trivial Pursuit plays a big part in this book because David and his two friends Hector and Scott are competing in this big Trivia Tournament and they play the game to practice. What is your favorite Trivial Pursuit category? Not everything about the 80s was light and fun – one of the major pieces of this book is the looming threat of the Cold War and David’s anxiety after watching The Day After – a pretty scary movie that shows the effects of nuclear war. Did you see that movie and did it have the same impact on you? How did you two come to know each other? What was your collaboration process like for writing This Is Just a Test? Did you meet in person or do most of your work online? Okay – that wraps up our show this week. If you have a question or an idea about a topic we should cover, I would love to hear from you. You can email me at booksbetween@gmail.com or message me on Twitter/Instagram at the handle @Books_Between.